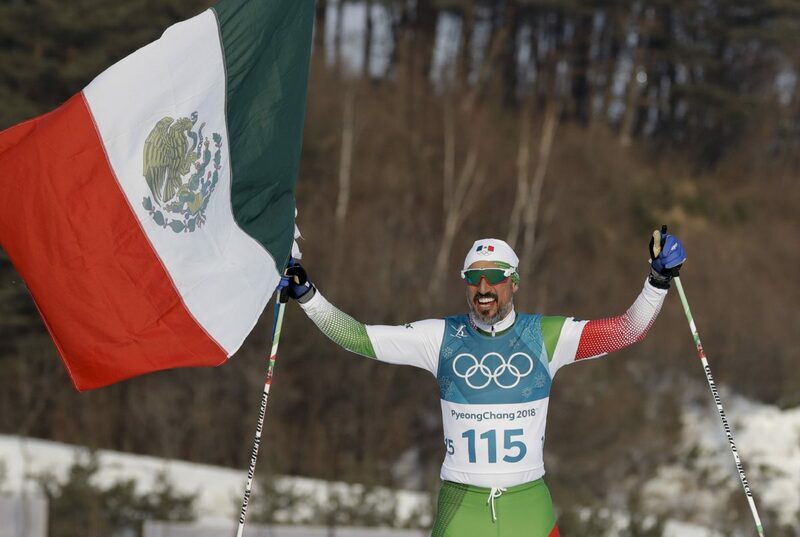 German Madrazo still remembers watching his TV through teary eyes as the Mexican National anthem played during a medal ceremony at the Olympics. Madrazo was watching Soraya Jimenez be awarded the gold medal for weightlifting at the 2000 Olympics in Sydney, Australia. Jimenez became the first woman to win an Olympic gold medal for Mexico. Madrazo was born in Mexico City and raised in Querétaro, Mexico. Growing up, he was a huge fan of every national team or athlete. He followed the Mexican national soccer team and never missed a match. He was glued to the screen every four years for the Olympics from the time he was 10. He made sure to watch from the opening ceremony all the way to the closing ceremony. Madrazo would read up on the Mexican Olympic teams, making sure he never missed an event. His love for the Olympics only continued to grow as he got older, and it started to become his dream. Madrazo was an athlete growing up. He ran and swam, and he learned his endurance was his biggest asset. But at the age of 16, Madrazo’s doctor said he would never run again. Madrazo was not to be denied, and as he continued to heal from his knee surgery, he began to run again. He was still in a great deal of pain, and finally, eight years later, he went to see a different doctor. He was relieved to learn he would heal and return to near perfect health, but he would need another three surgeries first. He needed to have both knees operated on. As the final surgery approached, Madrazo was so confident in his recovery to that point that he booked himself into an Ironman competition, which consists of a 2.4-mile swim, a 112-mile bike ride and a 26.2-mile marathon run. The surgery was set for November, and the race wasn’t until September of the following year. Madrazo knew it would be tight, but he remained confident he could pull it off. Then, he received the news that his appointment for surgery had been postponed. The surgery was not rescheduled for almost four months, and he finally underwent the procedure in April. Despite the short turnaround, Madrazo refused to accept no for an answer. He trained from the day he was released from the hospital. Madrazo still needed years to get back to the peak form he wanted to be in. But, he did it. Then, he started to dominate. After about eight years, Madrazo said he felt like he was fully healed. Madrazo was living in Tamaulipas, Mexico, at the time, working on his father’s ranch. He and his wife decided to move to McAllen, where Madrazo intended to start a family, and a running club. The idea was planted. Madrazo saved every penny he could over the next two years to put toward his own running store. He became obsessed with the learning process, and he dedicated his life to making a running store the Valley could rely on. He opened the store in June of 2011, and he has grown the business ever since. In 2014, a friend came to Madrazo with an article about cross-country skiing. Something clicked in Madrazo’s mind, and he realized this was his way into the Olympics. Madrazo said he didn’t know anything about the sport at the time, but he was ready to learn. The road ahead seemed impossible. Madrazo had to pay for everything on the road to qualification. He traveled the world, competing in events held everywhere from Bulgaria to Chile. Madrazo was chasing the number of points required by the International Ski Federation to qualify for the 2018 Winter Games. Madrazo finally hit the magic number on a cold and snowy night in Iceland, and he was off to the Olympics. Madrazo competed in the 15 km cross-country skiing event at the 2018 Games in PyeongChang, South Korea. A few months before he qualified, Madrazo was involved in a bike crash that kept him immobilized for a whole month. He wasn’t fully healed from the crash when he went to South Korea, so even though he finished last, finishing was the real accomplishment for Madrazo. Madrazo was at the Cavazos Sports Institute Saturday to share his story. Professional boxer Eric Molina, who resides in Edinburg, was the opening guest at the event.